Hey there! 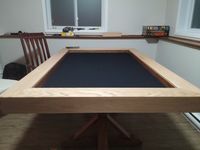 Here's my experience building a gaming table with some picture and a sketch up showing the table i'm planning to have once i've done my "touch up"
This fall, I had a free week and an empty room, so i built a gaming table after seeing different model online. I knew preparation was important, that's why i just bought some wood piece to practice some dovetail join with a chisel ... i was happy with the result and just built all the table right there. While i'm happy with the overall result, i must admit some part might have been better! I stained the leg with a paint brush, and i had a bad surprise. Where the 45deg. meet the other part of the leg, it look like stain got between those piece so after drying, we can see it's way darker. Also, the 45deg prove to be a challenge with my tools. The joint ain't really nice, but they are required to provide a lot more strength to the table (use dowel to glue those) ... after trying to shorten the legs, i saw the angle were not well glued up. That inspired me for the next design. The interior of the vauld is stained. Being red oak, it is way easier to stain and i find way better than the legs ... stupid pine! I'm really happy how the neoprene is right now. I had velour at first, but it's too "stetchy" for me, and the subfloor mat i used didn't glued well. The Neoprene is stapled underside, i'm having to vacuum it (with a soft bristle thingy). Did i say i'm really happy? If a part is not flush while gluing, i can always use a router with a flush bit to make it real smooth! 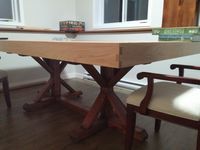 Hoping it will help and inspire those who are hesistant to build a table! And of course, for those with more experience, feel free to comment if you think my next table leg might end up a nightmare.